Let’s say you’re in charge of running a PPC campaign for a client with locations in multiple cities across the US. You’re tasked with making sure the budget is spent effectively for each area, maximizing ROI across the entire campaign while also being flexible enough to respond to client needs if necessary. 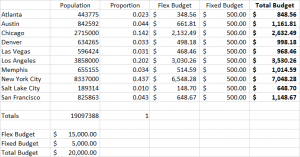 I’m going to go through a couple methods I’ve seen in the past, and then how I prefer to make adjustments when determining appropriate starting budgets. Believe it or not, I’ve seen this used. I guess they’re relying on location extensions to hope users self-select, but it’s a terrible idea. There’s no control over where the budget goes – a lot of it probably goes to no location in particular, and it’s just bad news. I understand the attraction to feeding in locations with the API and targeting a certain radius. As you target more locations, you have the ability to easily add them and the campaigns don’t need to be reallocated as well. But if you’re doing all of this in one campaign, you still don’t have the control to allocate spending towards certain locations. Those are bad practice. Let’s move on to at least minimal competency. Let’s assume you’ve properly set up a campaign or set of campaigns granular enough to target individual locations. This will allow you to adjust the budgets allocated for each city, helping you not only as a PPC manager to properly allocate spending to maximize ROI, but also sets you up to be able to respond to likely business objectives coming from the client. Is the Philadelphia location hurting? Shift ad spend there. Miami just hired another professional and they need clients? Shift budget there. Does the owner hate Tulsa? Don’t spend any money on that location anymore. In other words, assigning the same budget to every location/city in your campaign portfolio. If you’ve got 10 cities and a $20k/month budget, you’d be assigning $2k/month for each city. This method is a little lazy, but it works. You can then adjust based on bids and volume as you go, but you’ll be behind a bit. If you’re a very active manager, then this isn’t really a huge issue, but you can give yourself a head start by being a little smarter about the allocation. 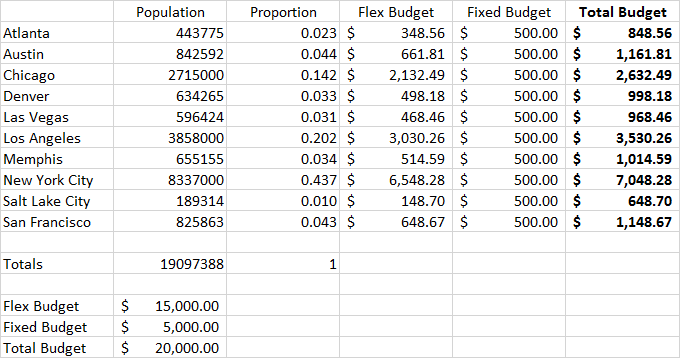 This isn’t a bad method for roughly estimating the appropriate allocation based on the cities in the campaign portfolio. One advantage to this method is that you can keep a list of major cities and their population so you don’t need to go back and do the same research every time you’re setting up a campaign. If you do a lot of campaign setups and engage in fairly active management, this could be a big time-saver and also give you a jump on the uniform budget allocation method. So I grabbed all the populations from Google, tossed them in Excel, and did some good, old-fashioned population adjustments. 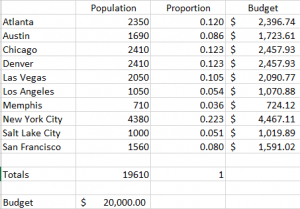 Column C is (population of city/population of all 10 cities). Column D (your new budet) is that proportion multiplied by the total budget. So with this new adjustment, we’re not spending nearly as much in Salt Lake City as we are in New York City. That makes sense. You can see how starting with a uniform distribution would have caused a lot of problem when trying to spend that budget effectively. This is just based on city population. It isn’t based on the popularity of the goods or services you’re advertising for in those cities. If your website exclusively sells Denver Broncos sports memorabilia or country music CD’s, then this probably isn’t the best way to do it. I just pulled those population numbers from what Google told me. They’re just city districts, not the service area of the local company. In reality, it likely extends beyond those city limits. Does this business let people from Oakland come across the pond and use their service? There’s an inherent fallacy in using city estimates. Have a little extra time? Let’s take the next step. Doing this solves for the two disadvantages I just mentioned for the population method (mostly). What I’m going to do is run a search for the top 3 highest volume keywords relevant for the clients industry, tag the city they’re in on the end, and sum those volumes. I’ll then do the analysis just like I did for the populations. Apparently the people of Atlanta like their yoga hot. And based on population, Chicago hates yoga. Now you know, I guess. But that’s useful to us as paid search managers, because this is going to change the budget allocations quite a bit from the population-based model. For the record, this method if my favorite. 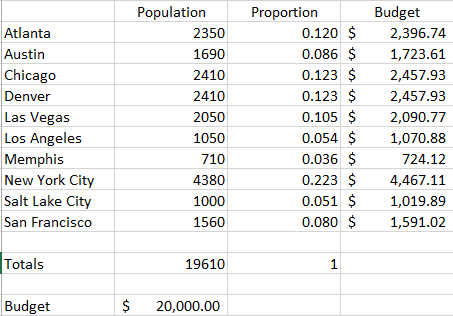 This model takes into account different prices in each city. Most likely a function of standard of living and competition in the area. Unsurprisingly, NYC, Los Angeles, and San Francisco have higher CPC’s than Memphis and Salt Lake City. If you’re going to drive the appropriate amount of traffic through those studio doors, we need to adjust based on those increased costs. If people know how Google works with regards to local results, you don’t need to add the geo-modifier anymore. So at this point, the above math is based on people who don’t realize that they don’t need to put their city in the search term. 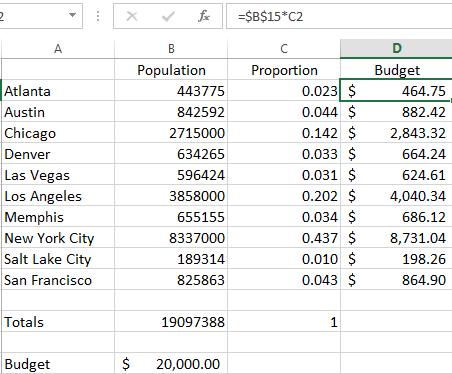 If you’re using a population adjustment that skews the numbers quite a bit, or you’re targeting regions with very few search results, it might make sense to assign a certain budget to each location, then allow the rest of the budget to be flexible based on your adjustment method. Since the Popular Keyword adjustment already looks pretty good, I’ll do this example on a fixed budget + population adjustment basis. I’m assigning 25% of the budget to be evenly distributed and the remaining 75% is distributed based on population. There. Now your yoga instructor in Memphis will be a little happier even though everyone there hates yoga. Of course, we could try to get even more sophisticated than this if we really wanted to, but as is the case with most PPC management decisions, you have to weigh the possible benefit of it with the time it’s going to take. Even this is probably overkill from an analysis perspective, but oh well – it’s Friday. So my point is: don’t use uniform budgeting, and certainly don’t group all your targets into one campaign.